Parenting is hard enough without being so hungry you want to eat your children. Of course, I would never do such a thing (I’m veggie, after all), but talk to me all you want about slow-release carbs and level blood sugar – if I’m restricting my calorie intake, I’m not the only one to suffer. It’s that time of year when everyone is on a diet, or so it seems. I’m never normally one to join them, but turns out that as the years creep on, you can no longer drink your body weight in Baileys with impunity. The Christmas bulge is harder to lose, and, as mentioned, the years are creeping on. In fact, I am going to be 40 in seven short weeks, and my Baileys belly is not invited to the party! I’m well known amongst family and friends for being a *bit* snappy when hungry. And my kids are annoying enough (LOVE THEM!) anyway. Combine the two and you have misunderstandings, sharp words and, I’m afraid, some downright shouting. Of course, even after a four-course meal, my children have the capacity to goad me, but when I am counting the minutes to my next (sorry-excuse-for-a-) meal, I find it particularly hard to exercise the patience and tolerance necessary for harmonious family relations. This occurs when the mother (me) is halfway between meals and goes to collect her children, who haven’t eaten for a barbaric three-four hours depending on the lunch rota. Sometimes I’m surprised the car doesn’t go up in flames before we manage to rip the snacks open. But still no snack for mummy. A similar phenomenon is found in the morning, when the children, high from their breakfast, contrast with their mother, who is so wound up with getting the three of them out the door, she has not been able to eat even if she’d wanted to. Even if the kids’ breakfast is not that sugary, they are still on a different plane to me, and the result is explosive. You don’t want that last chip, do you darling? We do a lot of physical labour: hoisting kids, kit bags, overloaded laundry baskets – and our asses – around all day. Add in emergency sprints to avert accidents at any given moment and you are clocking up quite a burn. We don’t get much sleep. The energy has to come from somewhere. We need brain power. If the doctor’s receptionist asks our child’s date of birth, we must not fail to answer as we’re gazing dreamily at the left-over Cheerios on the worktop. We need comfort. 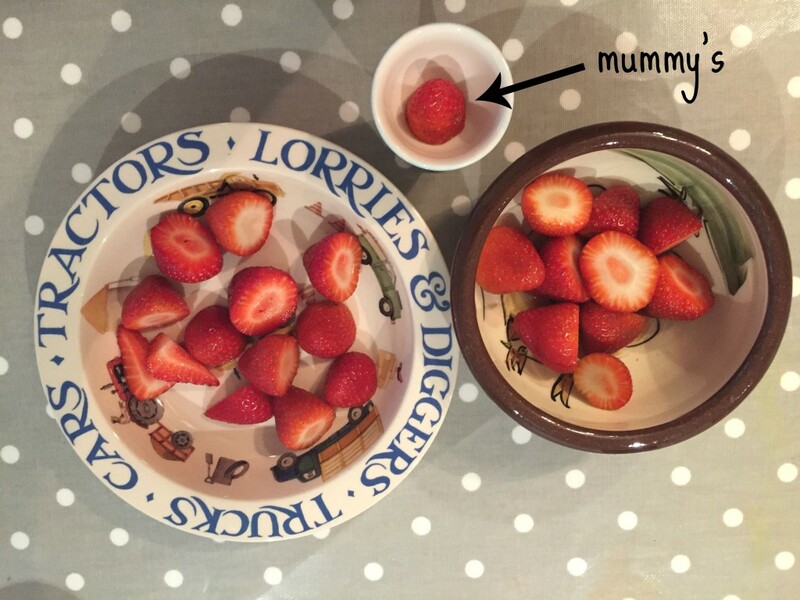 Yeah, yeah I know we’re not supposed to comfort eat in this new juicing age, but sometimes you need a little something when you’re tired, lonely, frustrated, bored, going mental or many of the other feelings common to mums. 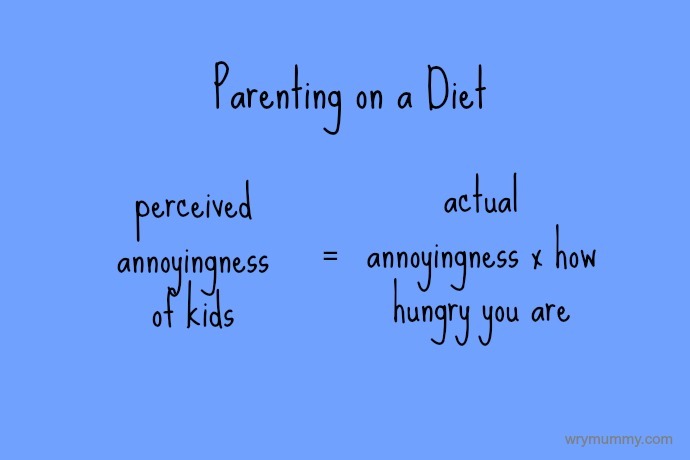 So how to combine Parenting and Dieting? I’m not saying you can’t diet and parent. Obviously. 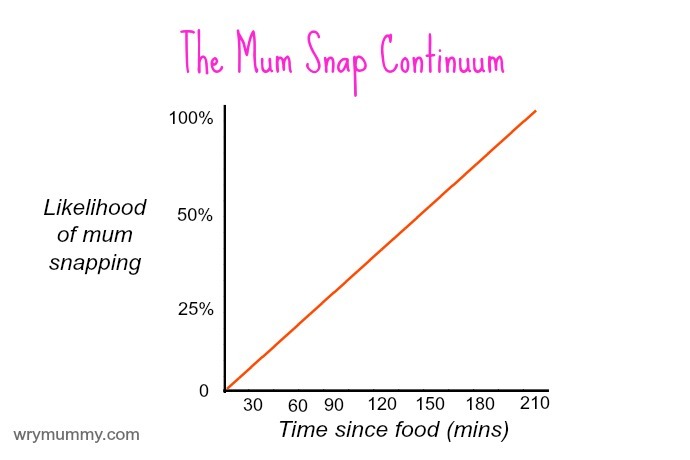 Although in moments of extreme ‘hanger’, you might find yourself thinking dark thoughts about how it’s your child’s doing that you’re in this shape in the first place (incorrect, in my case, the blame is fully at Cadbury’s door) it isn’t fair to take your diet out on the children. My adequately-fed self knows this. So before you snap at your child, ask yourself, is he really being annoying or does mummy need a snack? If after a hasty oatcake you still find them being unreasonable, then welcome to parenthood. 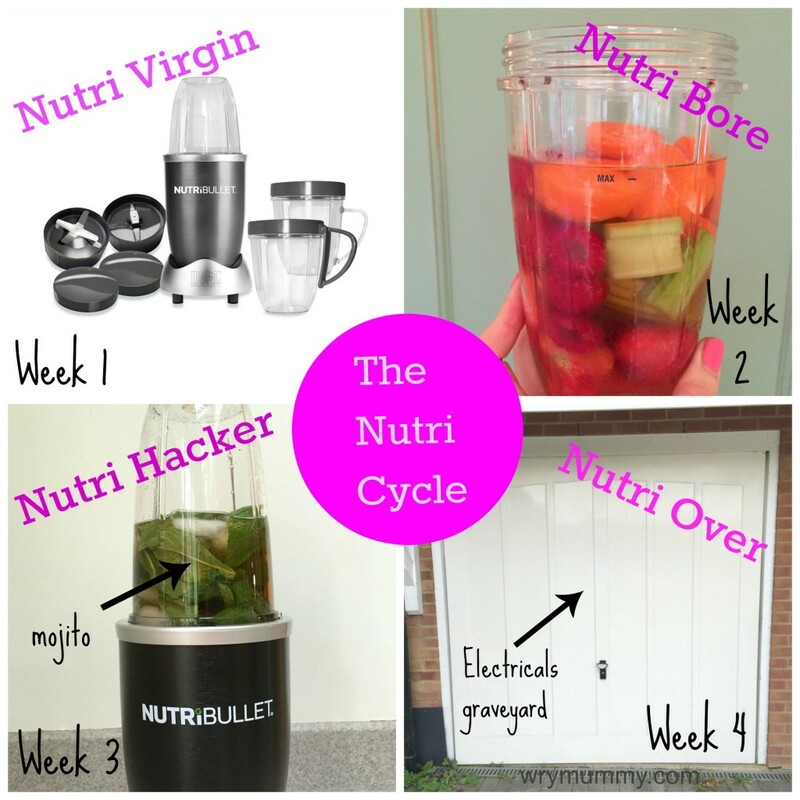 The Four Ages of NutriBullet: Which One Are You? Totally with you on this Jess, many things make me guilty of snapping but being hungry or stressed is right up there. Your mistake, was trying to do Dry January at the same time. What makes me laugh is that we know that all of us will be back in the same place by Nov/Dec, why bother?! I can so relate to this! I don’t do diets, have never needed to, but I do most definitely get hangry! Half of the time I don’t even realise that’s the problem, then I have a couple of mouthfuls of food and the world feels like a better place! Good luck with losing that belly in time for the 40th!